A Civil War reenactment group with a large event planned in Virginia this weekend has received a threat against people who attend. 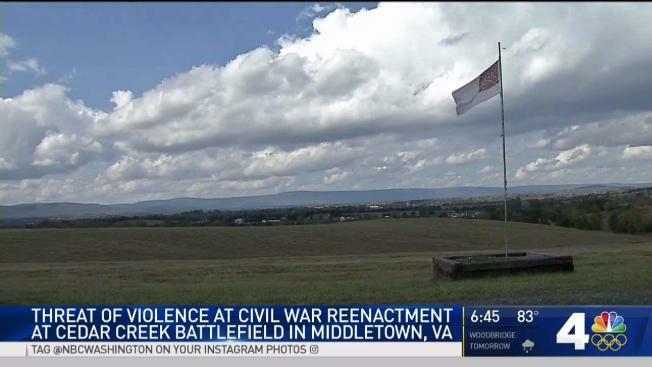 The Cedar Creek Battlefield Foundation will mark the 153rd anniversary of the Battle of Cedar Creek with two days of events Saturday and Sunday in Middletown, Virginia, about 80 miles west of D.C. Thousands of war reenactors will stand in for soldiers, and a large crowd will watch. Someone said in a letter that they would harm "attendants of this event," the foundation said its website. The Frederick County Sheriff's Office will provide additional security. Vendors who set up tents along the battlefield on Tuesday said they were not worried. "The nature of the threat was so immature and unsophisticated that it didn't give it a lot of credibility," Walt Gaylor of the company Timeless Colors said. Information on the exact wording of the letter was not available immediately. Gaylor said war reenactors and spectators would not be intimidated. "We're not threatened. Matter of fact, what we're hearing is more and more people are saying, 'Hey, because of this we are going to come out this weekend.' We'll be prepared. We will protect ourselves. And we're looking forward to a big event," he said. The Battle of Cedar Creek was fought in October 1864 and resulted in about 5,700 Union soldiers dead and 2,900 Confederate soldiers dead, according to the National Park Service. A Confederate lieutenant general's army "was shattered, and with it further Confederate resistance in the Valley ended," an NPS website says. "Occurring just three weeks before the presidential election, Cedar Creek gave sagging Northern morale a much needed boost and helped carry Abraham Lincoln to a landslide victory at the polls."